If you are a console game lover then you know how much horror themed games have changed gaming. From Resident Evil’s creepy monster dogs to the eerie static noises of Silent Hill, it’s definitely a genre that isn’t going away any time soon. The outrageous stories keep these games fresh and exciting. The app store is also no stranger to games with creatures that go bump in the night. But one such app is kicking it up a notch from the usual zombie fare. Dark Meadow by Phosphor Games, LLC is a dark and twisted tale full of mysterious surroundings and intriguing story lines. To start you awaken in bed of a disheveled looking hospital room. You are not sure what you are doing there. A strange man’s voice speaks over an intercom to tell you that you are trapped and you can only leave if you defeat the witch that plagues the hospital. Armed with a sword and crossbow you must wander the halls, battling any creatures that come into your path. As you wander you will collect items that will clue you in on the back story of the Montclair Hospital and also line your pockets to buy better weapons and build up your character’s experience to ultimately take on the haunting witch. Dark Meadow is filled with ominous surroundings that look simply incredible. The creativity of the sinister monsters that are encountered are straight out of a horror movie (Pans Labyrinth comes to mind). Overall it is visually impressive and I was completely thrilled to walk around the halls exploring every inch of the disturbing setting created by the Unreal Engine 3. At first the battles with the minions are entertaining and it takes a minute to adjust to the controls. A crossbow is used for long-range assault and is set up with a simple aim and shoot touch control. 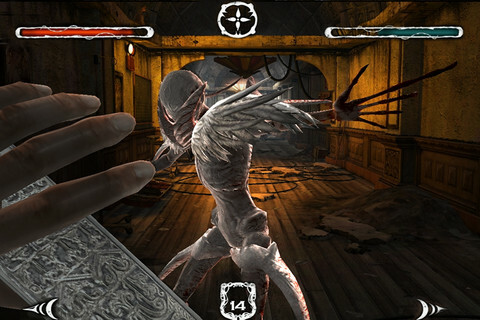 During melee combat there are buttons in the bottom corners of the screen for the character to dodge attacks, while one in the bottom center will allow you to block, though blocks are limited. To slice and kill opponents it’s a basic hack and slash touch screen, but works well without much skill in the long run. There is quite a lot of monsters to face, so be prepared to battle long and hard, though after a while it does get a bit repetitive. Just know that if you lose, you do not die but awaken back in the bed you started. All of your experience and items will be saved but this can be a set back as you must trek back through to regain your position. The thing that really keeps the game’s momentum going is the friendly voice from the intercom. He gives you hints about the hospital and is even quite funny at times. The voice doesn’t repeat himself and constantly engaging you with information to further your journey. The rest of the audio adds to the creepiness of the game and the timeless Myst-esque sparkling gems and documents to collect kept me coming back for more. Dark Meadow is twisted and scary fun. It looks great, plays great and is freaky as hell. It’s universal and $5.99 in the app store, which is a really great price for the quality of the game. It’s amazing how far this genre has come, and now it’s possible to play anytime with the convenience of the iPhone. Hey all! Dark Meadow is on sale for $2.99 through October 31st!!! What a great deal!